406.995.4989 - Celebrating 28 years of Gallatin River Adventures...! All participants are solely responsible for reserving a rafting trip appropriate for the group. All participants must meet minimum age qualifications. We are not able to verify or test your fitness or ability to participate in any of our adventures. The Lower Whitewater may contain Class IV whitewater. It is the participant's responsibility to understand the different classes of whitewater. At the time listed, being early is not necessary. We will recommend renting a wetsuit ($4) and booties ($4) when we think it is advised. We also recommend bringing a pair of shorts or a bathing suit and a T- shirt. Secure footwear you don't mind getting wet, if not renting booties. Footwear should be secure, NO flip flops or crocs. Always bring a long sleeve fleece or sweatshirt to wear on the river if available. Also, bring dry clothes for after. We have nice changing rooms and storage for your belongings. Bring long pants, and closed toe shoes. No shorts, sandals etc. A rain jacket or wind breaker is a good idea. Helmets are available. We are located in Big Sky, Montana. Our facility is on Highway 191 on the west side of the HWY, 1.5 miles South of the stop light in Big Sky. 46.5 miles north of West Yellowstone. 39 miles south of Bozeman. How and when to make a reservation? You can reserve online here or call us at 406.995.4989 We can accept reservations anytime, even the same day of the trip typically. We need a 24 hour notice for small groups, 48 hours for groups 10+. A 50% fee is charged for same day cancellations, reschedules and no shows....If you purchase the optional Cancellation Insurance then Rafting Trips can be rescheduled or cancelled at any time for any reason. Cancellation Insurance can be purchased here. Prior to departure participants must sign an assumption of risk agreement, release of liability and a disclosure of medical history. All participants must fit properly into our Personal Flotation Device(52” torso or smaller); Participants must not be under the influence of mind altering drugs or alcohol. 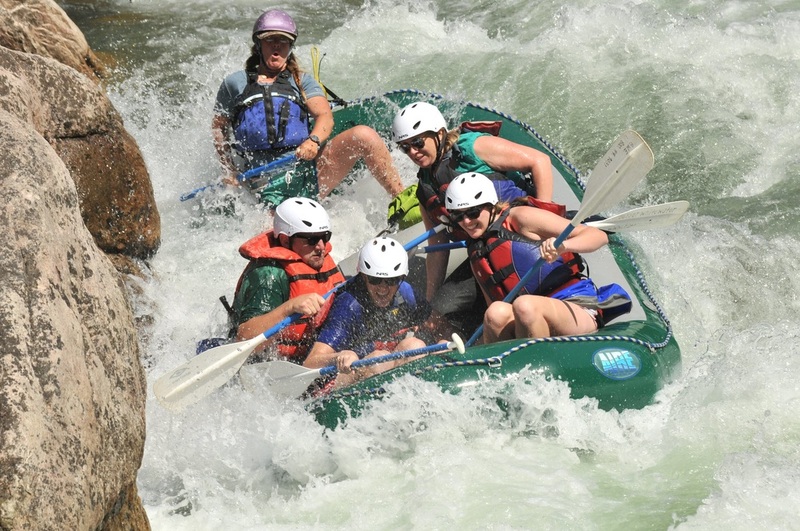 Participants are solely responsible for choosing a rafting trip appropriate for themselves and their group.All participants are solely responsible for reserving a rafting trip appropriate for the group. We are not able to verify or test your fitness or ability to participate in any of our adventures. It is the participant's responsibility to understand the different classes of whitewater. We are sorry but pregnant women are not permitted on river trips. Certain trips may have age restrictions at different times of the year. Generally the minimum age is 6. Age restrictions change daily with the water flows, please call for current restrictions. What is our season of operation? We are open on May 1st and close early September depending on weather and water conditions. Kayaking trips begin after the July 4th weekend. You will typically arrive at 10:30 or 2:30 and they take 3 hours round trip.. Kayaking trips are intended for athletic individuals with good swimming skills. Half day trips depart nearly every hour throughout the day. Half day rafting trips are on the river about 2 hours but take 3 hours round trip from our facility. Show up at 9:30 and we will depart at 10 a.m. and return around 4 p.m. Full Day trips include lunch and drinks on the river. Participation in any of our activities is at your own risk. Participants are solely responsible for choosing a rafting trip appropriate for themselves and their group. Participants need to understand that our rafting trips range from Class I to Class IV and be familiar with the International Whitewater Scale. Professional photos will be taken during your trip and can be viewed after the trip. Sunglass straps are highly recommended for your glasses on all river trips and can be purchased at the front desk. Disposable water proof cameras are available for purchase. If it's not water proof please don't bring it on the river. Plastic bottles of water can be brought on the river trip and can be purchased at the front desk. The changing rooms have non-locking storage bins for your clothes during the rafting trip. Valuables can be locked in your vehicle and keys checked at the front desk. Snacks and drinks are available at Geyser Whitewater. Changing rooms and restrooms are available. Adequate camper and RV parking is available. Dogs - Typically a shady spot can be found to protect your dog from the heat in the car. We do have a shaded kennel area for your use as well. Service dogs can do our scenic floats but are not permitted on whitewater trips. We can easily reserve other activities such as Zipline Adventures, Bike Rentals, Horseback Riding, Yellowstone Park Tours and more at no cost to you. All of our rafting trips meet at the Geyser Whitewater Building in Big Sky and we will handle the transportation to and from the river. There is no cell service, satellite or radio communications available on the rafting trips. Water temperatures range from approximately 42F in May to 60F in late July and August.